Writer/s: Andrew Stanton (original story), Andrew Stanton, Victoria Strouse (screenplay), Bob Peterson, Andrew Stanton (additional screenplay and story material). Starring: Ellen DeGeneres, Albert Brooks, Ed O’Neill, Hayden Rolence, and more. I might veer off the professional path that I try to keep my reviews on so I apologize in advance but…. THIRTEEN YEARS! THIRTEEN YEARS I HAVE WAITED FOR THIS! Thirteen years after the release of ‘Finding Nemo’. The Hollywood blockbuster of a kids movie that has been a staple in the memories of children and children-turned-adults is now given its rightful sequel in ‘Finding Dory’. A large amount of the cast, including Ellen DeGeneres herself, is back for the sequel and ready to land graciously in the hearts of millions with this much anticipated sequel. 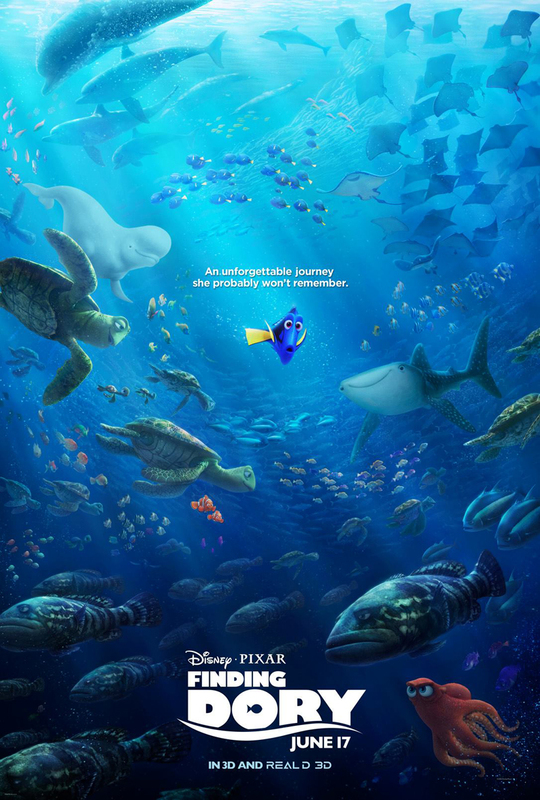 The story of Dory begins with a young Dory (Ellen DeGeneres) as she is working on her short-term memory problem with the help of her parents Charlie and Jenny (Eugene Levy and Diane Keaton). After re-iterating more on how quickly her memory is lost than audiences may remember from ‘Finding Nemo’, Dory goes through a series of attempts to remember important things throughout her everyday life. As time goes on, Dory finds herself incidentally split from her parents and begins a multi-year search to reunite with them. This search results in the events of ‘Finding Nemo’ then fast-forwards a year passed those events to the “present day” of ‘Finding Dory’. Dory then remembers her original goal of wanting to find her parents and restarts her search, along with the help of Marlin and Nemo (Albert Brooks and Hayden Rolence). The search results in seeing old and new faces and experiencing adventures unlike ever before for the sake of finding Dory’s parents. ‘Finding Dory’ hit home and satisfied the inner 11 year old in me that watched ‘Finding Nemo’. Even with a recent watch of ‘Finding Nemo’, I was still incredibly invested in the original and just as much so in the new one. I also caught myself laughing and smiling like a child at parts right along with the kiddie crowd surrounding me (which was a large majority… I have no regrets). ‘Finding Dory’ was entertaining for a kids movie. Had enough humor to satisfy young and old alike. The voice actors and actresses were great. Of course, I had a slight issue with some majorly unrealistic aspects of the movie near the end but beggars can not be choosers. Regardless, at the end of the day, ‘Finding Dory’ is already a box office hit with it only being Friday and is destined for record-breaking success. I highly recommend ‘Finding Dory’ for all ages and consider it a “must-see” for all audiences!